Need multiple hoses but only have one spigot? Get a Connector Shut-Off Valve! 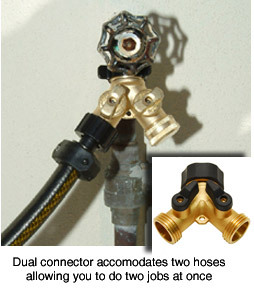 Connector valves fit between the hose and the spigot or between two hoses. They allow you to shut off water flow with the twist of a valve rather than turning off the spigot entirely. The brass connectors are available for one or two connectors, or select the heavy duty plastic 4 way connector for multiple hoses. The swivel connector ring at the top of each connector is made out of heavy duty plastic with molded tabs so you can easily connect and disconnect from the spigot or another hose. 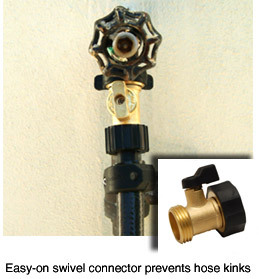 The swivel connector prevents kinks by allowing the hose to turn. All the connectors listed here attach to a standard spigot or male hose end. Attach one hose to this single valve connector. The swivel connector gives you maximum maneuverability with the hose by allowing the hose to turn where it connects to the spigot. This valve can also be used as an inline shut-off valve. A quick turn of the valve shuts off the water flow so you can turn the water on and off as needed for jobs that don’t require constant water flow. Constructed from brass, the shut off valve can withstand hot water and high water pressure. Do you use several different hose attachments during one detailing session? Switch between attachments in record time with the Brass Quick Connector Set. Just pull back the rubber ring on the female connector to release the male connector. Disconnect a hose from the spigot instantly. Switch between your Fire Hose Nozzle and your Foamaster in no time flat.